Only a godamn winking Branson! To see Richard wink, you must view the site on The Internet Archive. Make haste looking, mind, for he only does it once. There is, of course, a chance that he’s only winking at me and not every user that comes to the site. I actually moved into my current house only because a ginger tomcat sat on the bin outside winked at me when I was looking round. I’m a sucker for that sort of thing. 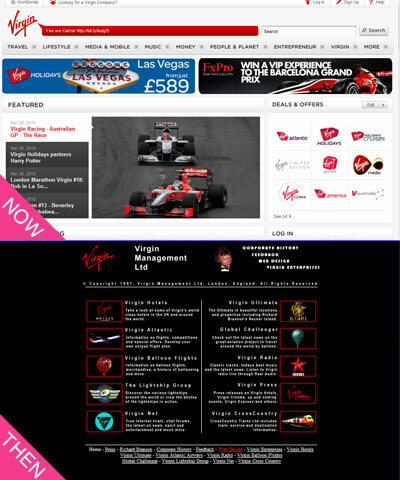 This entry was posted on March 15, 2010 at 5:46 pm	and is filed under Virgin. You can follow any responses to this entry through the RSS 2.0 feed. You can leave a response, or trackback from your own site. Photoshop proclaims it’s an animated gif to me. It’s a bit of a weird wink though. He looks like he is having some kind of wink spasm to me. you can set a gif to loop a certain number of times, rather than loop forever. Did you click on the image to see the foot-tapping Branson?